More than anything, I respect the “side hustle.” The hours of sweat and tears put in by someone after they’ve spent all day working at the “9-to-5” job that pays the bills. But the truth is, it’s probably the best way to start a business with little risk. The downside, of course, is that your average work day becomes much longer. 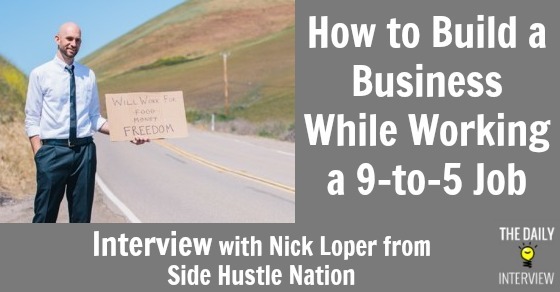 I’m excited to interview today’s guest – Nick Loper – because his site is all about featuring and learning from other people’s side hustles. In some ways, he’s done a lot of what I hope The Daily Interview can eventually do. It’s fascinating to read about these side hustles, and today we’re going to talk about Nick’s story as well as the best side hustle he’s seen through his site. He’ll also discuss what he thinks is the best way to get started with a side hustle if you’re looking to eventually break free from your day job. Nick, I’m a big fan of your site, Side Hustle Nation. I love the idea of the “side hustle,” and it’s inspiring to read others’ stories about them. It’s one of the reasons I started this site. Tell us a bit about yourself and your journey. What was your original side hustle when you worked full-time? How did it progress, and did it eventually get big enough so that you could quit your full-time job? 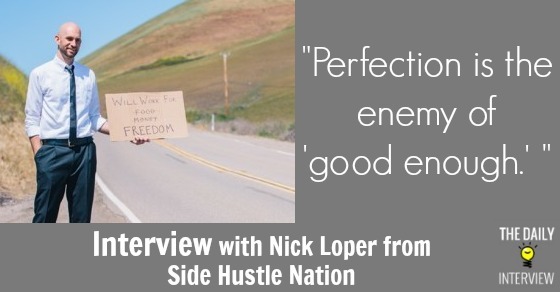 What led to the creation of Side Hustle Nation? My original side hustle was an affiliate marketing business. It actually started on a very small scale in college, and ramped up after graduation. I used AdWords to refer searchers to specific products, and collected a commission when they bought something. I didn’t really realize it at the time, but I was “validating the market” in a very 4HWW-type-style. Only that model became very difficult to maintain and scale, so I figured a more viable long-term strategy would be to build my own database of products and drive traffic to that site first. It was slow going, but it worked. It was a $10,000 initial investment to have the site built (I found my developer on Guru.com), and I was probably only comfortable placing that bet because I had some “proof of concept” data to stand on. From there, it was a slog — 3 years of nights and weekends before I got up the nerve to quit my job. I was probably overly conservative, and the business has seen a ton of ups and downs, but I’m still running it today. Side Hustle Nation is my latest project, trying to spread the gospel of this lower-risk brand of entrepreneurship. You don’t need venture capital money or some insanely great universe-denting idea to get started. You can build something in your spare time and scale it up from there. My challenge for this year and beyond is to turn Side Hustle Nation into a viable revenue-generating side hustle of its own. What I consider my greatest success is probably a non-event for most seasoned entrepreneurs: just not having to get a real job in 5+ years. I love being able to work from home with no commute, hang out with the dog, and have no boss to ask if/when I take time off. My wife and I took advantage of that and spent 5+ weeks in Japan and SE Asia last fall, and while we can’t afford that kind of trip every month, it was a ton of fun and very rewarding to be able to do it. The other thing that keeps me going on Side Hustle Nation, even with no business model to support it yet, is the blog and podcast feedback from readers and listeners. Helping other people earn more money and change their lives for the better is really what it’s all about. All successful people fail throughout their journey to success, but hopefully, each failure is a new learning experience. What do you consider to be your biggest failure, and what did you learn from it? But my biggest failure is a five-figure outsourcing mistake I made when working on a redesign of ShoeSniper.com. I was fed up with my current development team for some frustrating technical shortcomings and communication issues, so I went shopping around for a new team to rebuild the site from scratch. It ended up being a total disaster. Initially I blamed the developers (not one, but two different companies tried and failed), but ultimately it was my bad. I didn’t do a detailed enough job explaining the scope of the project from the onset, didn’t do a good enough job as the “general contractor” in managing the workflow, and let the misery drag on too long after missed deadlines and deliverables. Almost any software development project is going to run into snags, but I really learned a lot about management and outsourcing from this painful and expensive experience. You’ve seen many different side hustles from people you’ve featured on your site – which one was your favorite, and why? Tell us a little bit about it. My favorite side hustle is the one you can take action and execute on. We’ve heard some amazing success stories about self-publishing, niche sites, affiliate marketing, blogging, app development, coaching, freelancing, and more. I hate to contribute to the information overload in our daily lives, but I want to show people there’s no such thing as the “best” side hustle — it all depends on what value you can bring to the world. I will say, the most popular episode yet is the story of the Fiverr seller who earned enough to buy a house. Hint: it’s all about the upsells, or gig extras. For someone who is currently stuck in their “9-to-5” job and really wants to break free by starting their own side hustle, what are some good first steps? What do you wish someone told you when you first started? To brainstorm the services you could possibly sell, go back through your resume and look at every job you ever had. Is there some skill that might make you a valuable free agent on the open market? What are you interested in? What do your friends and family ask you for help with? What I wish people told me? I wish I’d started the “side hustle”-focused site when I began blogging in 2009. I may not be 4 years ahead of where I am now, but it would been a decent head start. To be fair, people did tell me to niche down, but I didn’t listen. Maybe I wasn’t ready to hear it and had to learn on my own. I think the biggest takeaway is to start today. A year from now, you’ll wish you started a year ago. Make something happen, build a site, sell something, make mistakes, start over, try again. I like to look at different projects through the “experimenter’s mindset.” Consider this: a scientist never fails — either his experiment worked as he thought it would, or he goes back to the lab with a new hypothesis. And the sooner you start, the sooner you can start failing and adjusting course and eventually finding the right formula. If there’s one quality that stands out amongst the 40+ Side Hustle Show guests so far, it’s persistence. They’re all inherently motivated to succeed, and it’s not necessarily about the dollars. There’s some internal drive mechanism at work here pushing them forward and pushing past failures. Let’s take a step back and look more generally at making your side hustle successful. If you had to take your best advice and put it into one sentence or phrase, what would that be? Fiverr. Everyone knows Fiverr but I’m still amazed at some of the stuff you can get done for $5 or a little more. It’s generally my first outsourcing stop. Text Expander for Chrome. (free) This is a new tool for me but I’m absolutely loving it so far. If you find yourself writing out template-driven emails or common phrases, give this a shot. LastPass. (free) Seriously a life-saver. Just one less thing to clutter your brain with. The bad news is I don’t know any of my passwords anymore! Buffer (free) I’m loving the buffer app to stockpile a bunch of tweets. Cool way to share other people’s content ? which is great for networking. ScheduleOnce (free) Super-handy Google Calendar scheduling software. Eliminates the 6-email back-and-forth of trying to set up a meeting time. Thanks so much Nick for talking “side hustles” with us today! What do you think about this interview, and side hustles in general? Leave a comment below! Hey Eric, thanks for having me on — honored to be included here alongside some of my online “heroes.” If anyone has any questions about side hustling, affiliate marketing, or biz in general, definitely feel free to reach out or reply to this thread. Thanks Nick, it was a pleasure having you here and hearing your story. Great interview and excellent advice. I agree with Nick that freelancing is a good place to start with your side hustle, especially for a first time entrepreneur. I recommend guru and elance to start. Thanks for creating this blog Eric, you just got a new subscriber. Great interview – interesting that you should mention elance as a side hustle. Freelancing for elance was my first foray into earning something other than my 9 – 5. I got a few great regular clients who paid me a reasonable amount to write articles. My light bulb moment came when I realized that rather than writing for someone else (and giving away my copyright), it would make more sense for me to use the experience I had gained to write for my own ends. I love the idea that it’s ok to fail. And I completely agree with Nick’s comment regarding the internal drive and persistence that we side-hustlers have. I’m so determined to succeed that I know I will just keep going. And it’s interviews like this that spur me on, so thank you Eric for this great interview and thank you Nick for the great advice and inspiration. I’m not at my destination yet but I’m loving the journey! Thanks so much for the comment, Mary. It’s great to see that you had your “light bulb moment.” Best of luck to you!